Last year, we reviewed the BT Ultra HD (4k) TV service on its launch. We were very impressed with the image quality achieved with BT's flagship Ultra HD football content. We now review Sky's own Ultra HD service, which is delivered using Sky's new Sky Q Silver set-top box. While BT was the first company in the UK to launch a broadcast Ultra HD service, Sky takes the crown for offering the most comprehensive Ultra HD service, which, in addition to football content, includes movies and box sets. The majority of Sky's Ultra HD content is delivered 'on demand' via broadband rather than satellite broadcast. A huge advantage for Sky (compared with Netflix and Amazon Prime) is its use of progressive downloading rather than streaming, allowing users will relatively low broadband speeds to view and record Ultra HD content in all its glory. All in all, it's a superb start for Sky and has certainly been worth the wait. 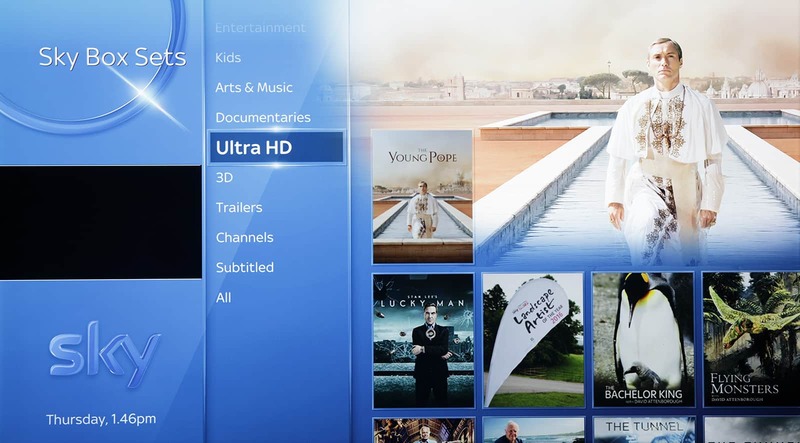 Since the launch of its Ultra HD service, Sky has been gradually adding Ultra HD movies, which can be found in the dedicated Ultra HD part of Sky Cinema. At the time of the review, the following 25 titles were available in Ultra HD format: 13 Hours, The 5th Wave, Amistad, Angels & Demons, Annie, Bridge of Spies, Chappie, The DaVinci Code, A Few Good Men, Forrest Gump, Ghostbusters, The Godfather, The Godfather Part II, Grimsby, Jerry Maguire, Lawrence of Arabia, Maze Runner: The Scorch Trials, Minority Report, My Best Friend's Wedding, The Patriot, Paul Blart: Mall Cop 2, The Perfect Guy, Spectre and Spider-Man 3. In general, picture quality is significantly superior to the HD versions of the movies. 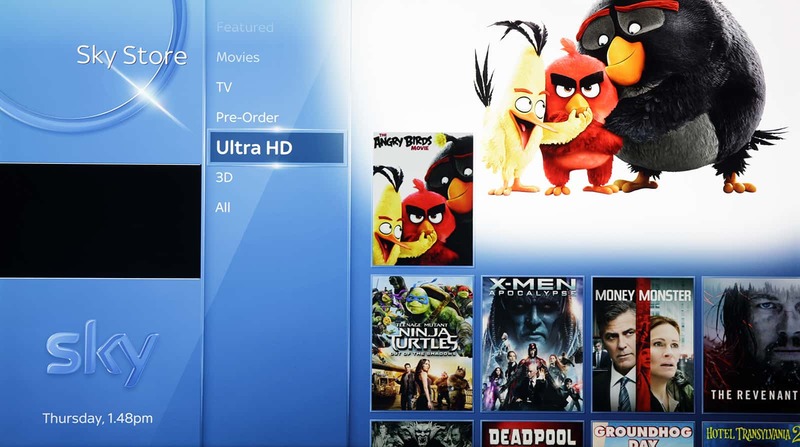 Sky also includes 16 titles that have been "remastered for UHD". These are: Captive, Daddy's Home, Everest, The Gambler, Goosebumps, The Martian, Mission Impossible - Rogue Nation, Paranormal Activity: The Ghost Dimension, Pixels, Project Almanac, Scouts Guide to the Zombie Apocalypse, The Spongebob Movie: Sponge Out, Star Trek, Terminator Genisys, Top Five and The Walk. Since Sky claims to have over 1,000 movies on demand, 41 UHD titles currently represents about 4% of its total movie catalogue. This percentage will clearly increase over the coming months and years. In addition to its Sky Cinema offering, Sky also offers a range of premium 'on demand' movies in Ultra HD format for rental. At the time of review, the following seven 'premium' titles were available: The Angry Birds Movie, Money Monster, The Revenant, 10 Cloverfield Lane, Risen, Concussion and The Night Before. Available for £5.99 were the following 22 titles: Star Trek Into Darkness, The Amazing Spider-Man, Total Recall (2012), Flight, That's My Boy, Karate Kid (2010), Men in Black 2, Men in Black 3, Shutter Island and Battle: Los Angeles, Taxi Driver, Glory, Pineapple Express, Hancock, The Other Guys, Salt, Bad Teacher, Think Like a Man, Premium Rush, Philadelphia, Julie & Julia and The Ugly Truth. As with BT TV, Sky has focused its initial Ultra HD sports coverage on football, with 124 live Premier League games to be shown in the current season. Football will eventually be joined by Formula 1, with every Formula 1 race to be shown in Ultra HD in the 2017 season. The images from Sky's football coverage generally look absolutely superb, being similar to the amazing Ultra HD picture quality we have witnessed from BT Sports, and this is not just evident 'on the field'. Studio footage, for example of presenters and pundits being interviewed, looks absolutely incredible. We cannot wait to see other sports, such as cricket, making the transition to Ultra HD, although Sky has only announced the timescales for the launch of Formula One. In addition to movies and sports in UHD, Sky also offers a range of other content in the format, and these can be accessed through the Ultra HD section of Sky Box Sets. This includes music, arts and nature programmes as well as traditional box sets. At the time of the review, the following UHD titles were available: The Young Pope Season 1, Stan Lee's Lucky Man Season 1, Landscape Artist of the Year 2016, Bachelor King, Flying Monsters, Conquest of the Skies, Natural History Museum and Galapagos (all with David Attenborough), The Tunnel (series 1 and 2), Blur - New World Towers, The Story of God with Morgan Freeman, The Blacklist (seasons 1, 2 and 3), Fortitude, The Last Panthers, The Enfield Haunting, Big Cats, Richard Hammond's Jungle Quest, Behind Russia's Frozen Curtain, Giant Sea Serpent, Rivers Jaws - Monster Catfish, Secret Life of Pearls, Wild Namibia and Strike Back (Project Dawn, Vengeance, Shadow Warfare and Legacy). 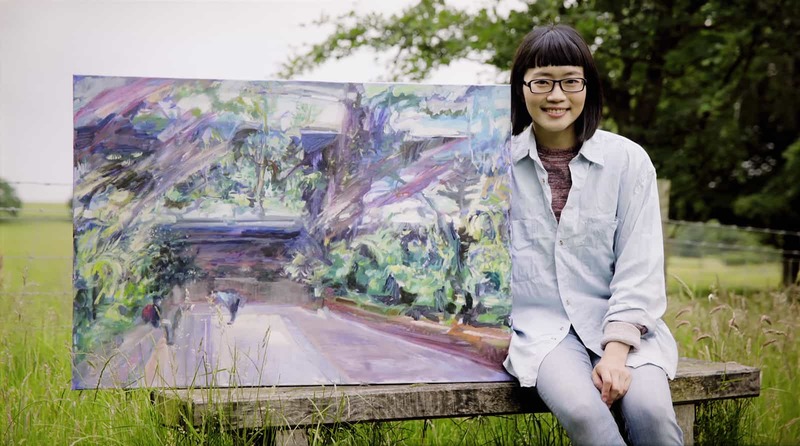 Some of the UHD content is simply jaw dropping, for example, the recent Sky Arts programme Landscape Artist of the Year 2016. Skins tones look so lifelike, with rich colours and immense detail. The image below was taken of a Sony Ultra HD TV showing the programme by a digital SLR camera. set the correct on-demand default download format. A huge advantage for Sky's Ultra HD service is its suitability for households that suffer from relatively low broadband speeds. While other Ultra HD services are available in the form of Netflix, Amazon Prime and BT Ultra HD TV, these all require relatively high broadband speeds to work. Netflix Ultra HD content is streamed at 15.6 Mbps while Amazon's website states that you need a high-speed Internet connection of "at least 15 Mbps" to watch videos in Ultra HD. BT's Ultra HD service is even more restrictive. As described in our Review of BT's Ultra HD (4k) TV Service, BT will only progress an order if the download speed of the line is estimated to be at least about 45 Mbps. This is to ensure that there is adequate headroom above the data rate required to watch the Ultra HD channel (up to about 30 Mbps) to be able to use the broadband connection for other things (for example, recording another HD channel or browsing the web on other devices). For live Ultra HD broadcasts (football, currently), Sky uses satellite transmission and reception. 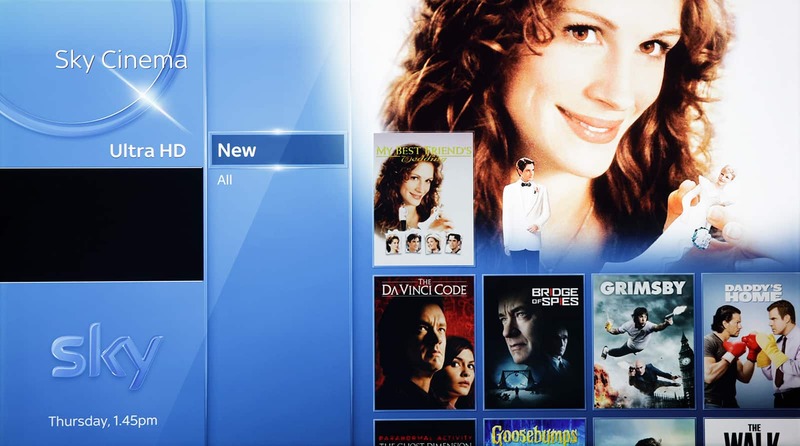 For 'on-demand' downloads, Sky uses a technique called progressive downloading to the hard disk in the Sky Q set-top box. The higher the broadband speed, the quicker it takes to download a programme. The downloaded programme can be played as soon as enough of the file has been downloaded. With a fast broadband connection, playback is possible within seconds of the download commencing. With poor broadband connections, there may be a significant wait until the downloaded programme can be viewed. 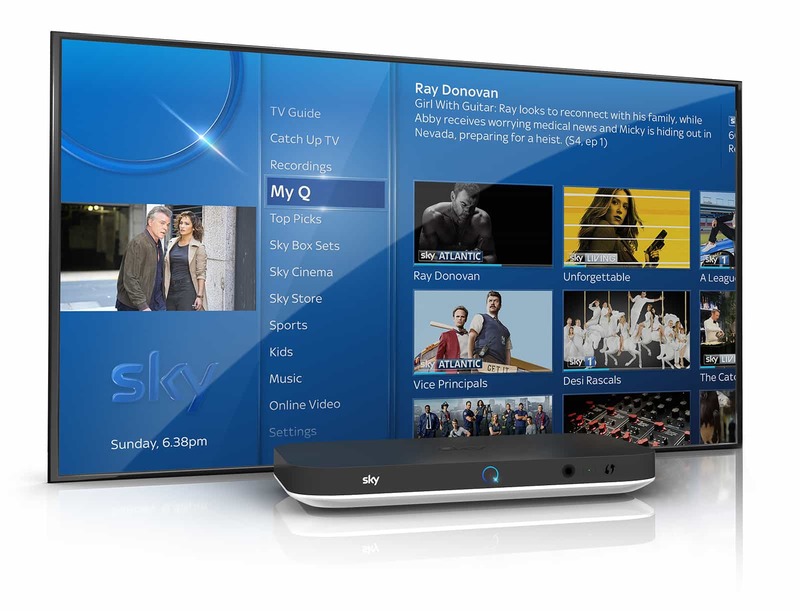 However, once the file is downloaded, Sky Q customers with slow broadband connections can enjoy the same picture and sound quality as those with superfast broadband connections. Ultra HD movie titles are encoded at a data rate of about 18.2 Mbps, as shown in the table below. This data rate is significantly greater than the Ultra HD data rate currently used by both Netflix and Amazon Prime. The Ultra HD encoding rate of 18.2 Mbps is about three to four times the corresponding encoding rate of HD content, meaning that an hour of Ultra HD content will consume about three to four times the capacity of the hard disk in the Sky Q box. A one-hour Ultra HD programme requires about 8 GB of storage, so the 2TB hard drive can store the equivalent of about 256 hours of Ultra HD content. This is more than ample for most users. It's still early days for Ultra HD, and Sky's service currently lacks two features that would significantly enhance picture and sound quality further. Sky currently lags behind Netflix and Amazon Prime by not being able to offer High Dynamic Range (HDR) content. HDR is set to make a more significant difference to picture quality than the higher resolution of Ultra HD. HDR allows a television (or projector) to display a greater range between blacks and whites, while making colours much more dynamic. HDR is already available with Ultra HD blu ray, Netflix and Amazon Prime. The good news is that HDR has been developed for TV broadcasting, using so-called Hybrid Log-Gamma (HLG) technology. However, it is currently unclear when Sky will commence HDR broadcasts. Sky also lags behind alternatives in terms of advanced surround sound. Sky’s Ultra HD broadcasts and content come with the same compressed Dolby Digital soundtracks as its HD content, and a number of Sky Q customers have suffered from sound glitches. Sky’s sound quality is currently significantly inferior to the uncompressed audio formats (Dolby TrueHD, DTS-HD Master Audio, Dolby Atmos and DTS:X) available with blu ray and Ultra HD blu ray discs. Sky’s Dolby Digital sound quality is also inferior to Dolby Digital Plus, which is used by Amazon Prime, Netflix and BT. BT announced this month that it plans to become the first UK broadcaster to offer Dolby Atmos sound. BT expects to make this sound enhancement available to BT Sport Ultra HD customers in January 2017. BT claims that Dolby Atmos will allow it to offer the “most immersive experience possible”. It is unclear when and if Sky will launch major improvements in sound. Overall, we are very impressed with the Sky Q Ultra HD service, particularly While BT was the first to market with Ultra HD broadcasting, Sky decided to wait until it could offer a significant amount of Ultra HD content. The use of progressive downloading means that even customers with slow broadband connections will be able to enjoy the substantial picture quality benefits of Ultra HD.